The Son of Bigfoot (also released internationally in English as Bigfoot Junior) is a Belgian-French computer-animated comedy-drama film. It is directed by Ben Stassen and Jeremy Degruson. Upon release, the film received positive reviews from critics and grossed $50 million worldwide against its $20 million budget. As of March 2018, the film had topped 8 million admissions worldwide. The film was released on DVD on May 1, 2018, in the United States. A sequel titled Bigfoot Superstar will be released in 2020. HairCo. is a megacorporation run by Wallace Eastman that specializes in improving people's hair. His helicopter chases after a scientist named Dr. Harrison who escapes by jumping into a river. Years later, A young boy named Adam Harrison, son of Dr. Harrison, lives out his life being harassed by the local bullies and being the crush of a kindhearted girl named Eva. After discovering not only the fact that his father is alive, but also his current location from a box his mother Shelly had kept hidden , Adam sets out on an epic and daring quest to uncover the mystery behind his long-lost dad, only to find out that he is none other than the legendary Bigfoot. He has been hiding deep in the forest for years to protect himself and his family from Eastman who is eager to run scientific experiments with his special DNA. 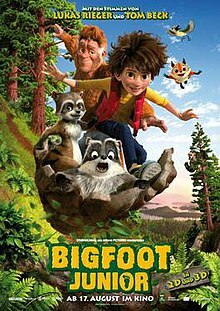 As father and son start making up for lost time after Adam's initial disbelief, the boy quickly discovers that he too is gifted with superpowers that are similar to his dad like having large feet (as expected from a Bigfoot), supersonic hearing, running at incredible speeds, and speaking to animals like Tina the Red Squirrel, Trapper the Raccoon, his wife Weecha, Wilbur the Kodiak Bear, and Steve the Woodpecker. But little do they know, Eastman is on their tail as Adam's traces have led them to Bigfoot. In order to draw out Adam, Eastman arranges for his mother Shelly's car to be intercepted by his men. After Adam is apprehended, he is unknowingly overheard on where his father lives. This leads to a chase, a forest fire and ends with Bigfoot getting captured. Eastman and his scientist Dr. Billingsley begin their experiment on Bigfoot who they remember in his human disguise of Dr. Harrison. The hair sample is tested on Dr. Billingsley's usual intern who recurring asks Dr. Billingsley to sign his volunteer paper. With help from the animals, Adam rescues his father which leads to the HairCo. facility being destroyed. Before Eastman can take action on Adam and Bigfoot, he is tranquilized by Shelly as Bigfoot states that he is done with hiding. Dr. Billingsley crawls out of the wreckage as his intern tries to get him to sign his volunteer paper (a running gag through most of the film). At the end, Bigfoot has come back home and the animals have taken to living with the family. A magazine cover shows that Wallace Eastman has been arrested for his illegal activities. On his way to school, Adam's bullies attempt to haze him again but having gone on his journey, Adam calmly tells them that he's finally had enough and kindly asks to be left alone. When they refuse to comply, Adam summons his animal buddies who scare them into leaving him alone while secretly dismantling their bikes and skateboard to make them crash to further punish them for their previous harassing of Adam which the latter sees and laughs at. Adam dismisses his friends as Eva spots the scene and asks about it, Adam asks if she would walk with him to school and she agrees while he begins to explain his life to her. Ben Stassen announced that a sequel is in the works under the title Bigfoot Superstar, due out in the summer of 2020, which will take places some years after the first movie. On review aggregator website Rotten Tomatoes, the film has an approval rating of 75% based on 20 reviews, with an average rating of 5.6/10. ^ Milligan, Mercedes (7 April 2017). "StudioCanal Teases 'Son of Bigfoot'". Animation Magazine. Retrieved 6 July 2017. ^ "The Son of Bigfoot 2017". releasedatehub.com. 5 April 2017. Retrieved 6 July 2017. ^ a b "The Son of Bigfoot". Box Office Mojo. Retrieved 27 December 2017. ^ "Ben Stassen Set to Direct 3D Animated Sequel "Bigfoot Superstar". Variety.com. Retrieved 17 January 2019. ^ "The Son of Bigfoot (2017)". Rotten Tomatoes. Fandango Media. Retrieved 8 May 2018.